Last summer we did a full makeover to bring the nursery up to big-boy status (read all about it here). 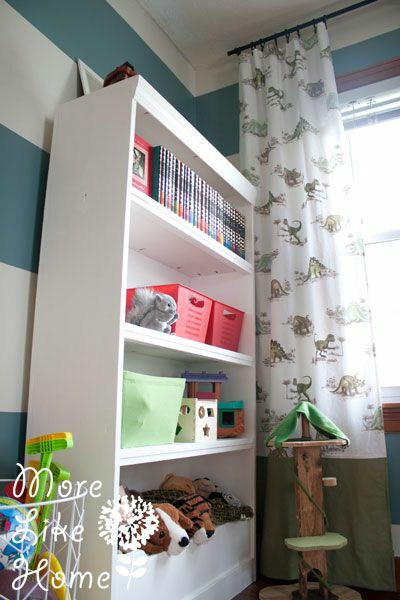 Part of the makeover included building a new storage-packed bookcase (based on this one by Land of Nod) to house the toys and books. 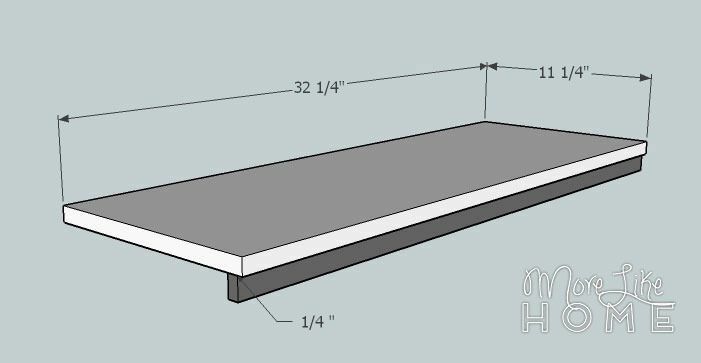 Today we're sharing the plans so you can make your own! 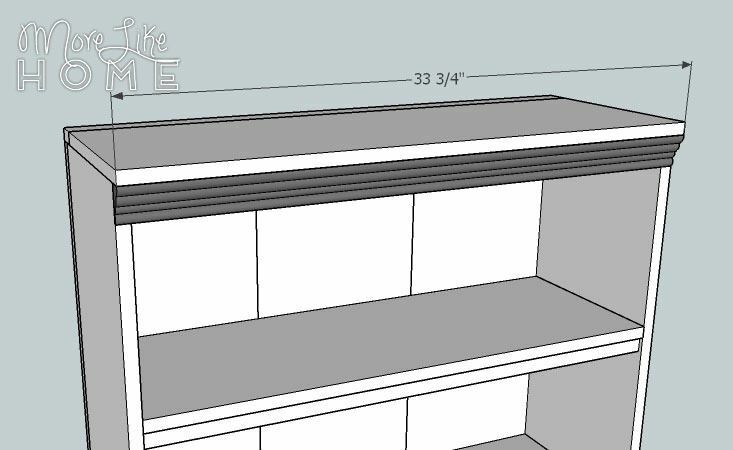 On of our favorite features of this bookcase is the built-in bin at the bottom. 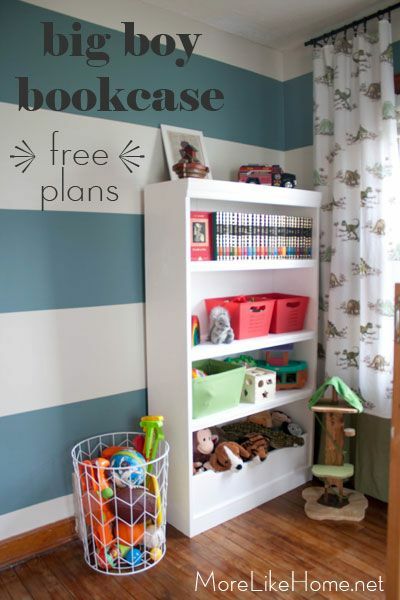 It's perfect for corralling balls or those pesky stuffed animals that never want to stay put. 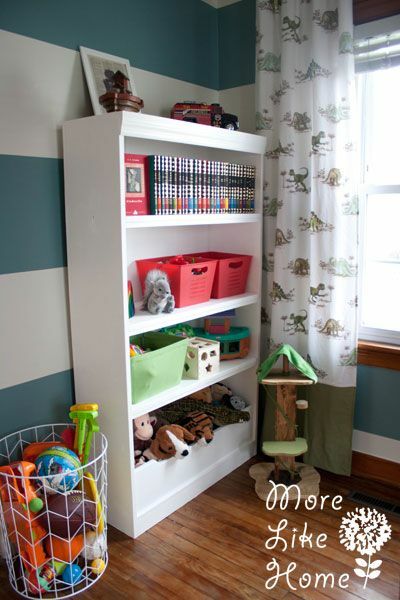 Plus it easily converts to a regular shelf when the kids get older (you know, past the stuffed animal stage). 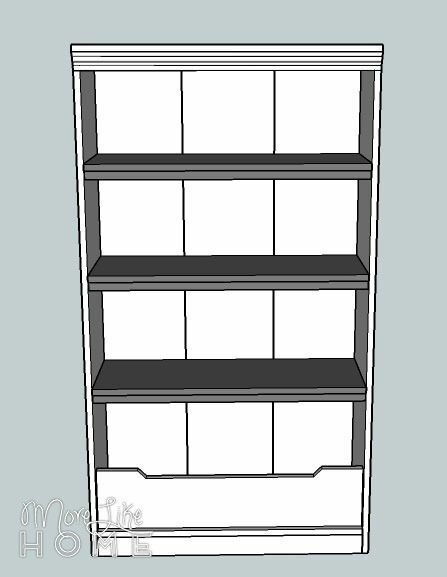 The three shelves hold lots of toys and are easily adjustable to fit your specific toys or bins. 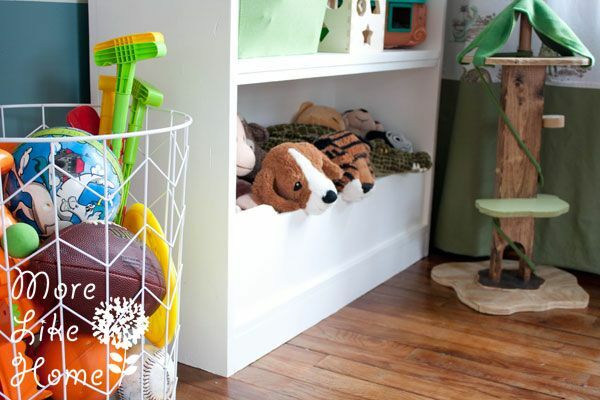 Plus you can add a fourth shelf if you have shorter toys to organize, or cut back to two to fit taller baskets. And if this isn't enough storage for you, just build a pair! 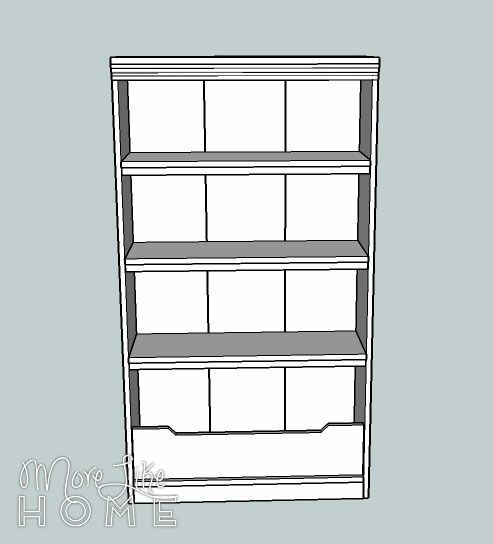 The flat sides make this bookcase perfect for lining up multiple units side-by-side (like this). 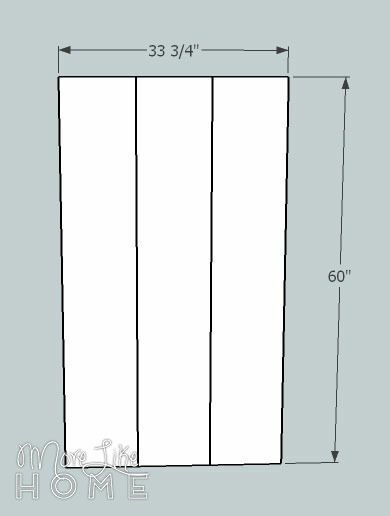 Overall dimensions for one bookcase are 33 3/4" wide x 60 3/4" tall x 12" deep. Remember to use glue before drilling each step (you don't need to wait for it to dry before continuing). 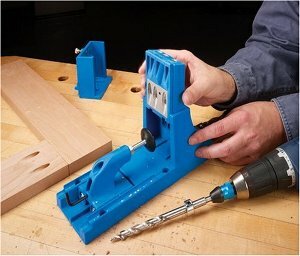 If you're using a Kreg Jig, it helps to drill those holes in each piece before you assemble it so you don't have to work the jig around a huge bookcase. Work on a level surface. Be careful and have fun! Start by assembling the three back pieces (A) side by side (use glue!). We used our Kreg Jig to attach them together on the back. 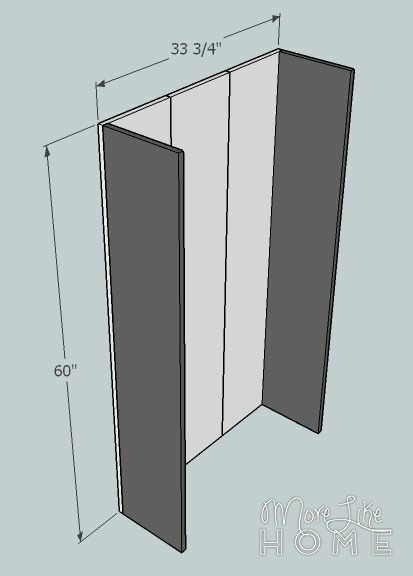 If you don't have one, you could get an extra 1x2 and attach a strip along the top and bottom edges to keep them together (attach them on the side that will be the inside of the cabinet). If you do that, make sure you leave 3/4" of space between the ends of the 1x2 and edges of the back. Next attach the sides (B). They should sit on the front side of the section you just built and line up flush with the edges, top, and bottom. We used our Kreg Jig to attach these (glue first! ), or you can drill through the back into the sides. Next attach the toe kick (C). It should be at the bottom at the front, flush with the bottom and flush edges. We used... you guessed it... the Kreg Jig, or you can drill through the sides into the ends of the toe kick. Then install the bottom (D) on top of the toe kick. 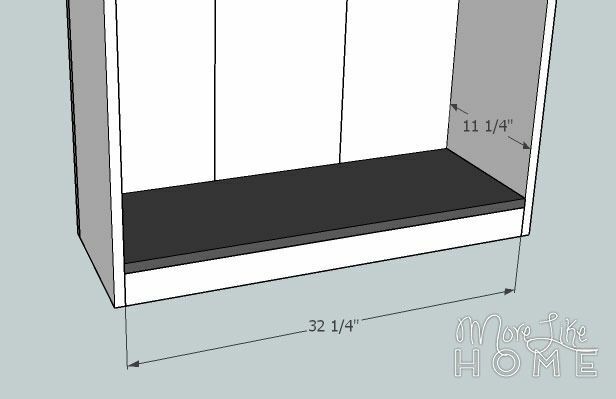 You'll want to lay the bookcase down so you can see under the bottom and measure along the back of the shelf to make sure it's level (it should be 2.5" up to match the front edge on the toe kick). 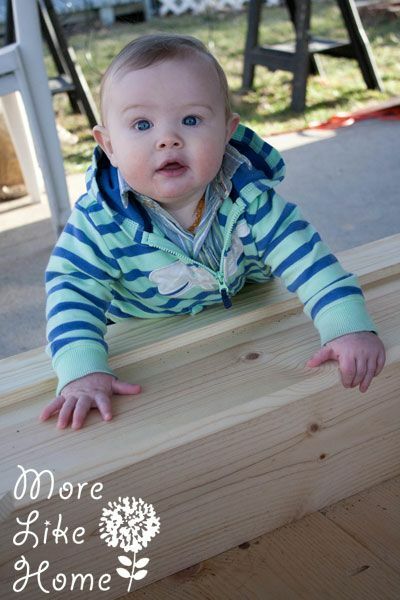 We used the Kreg jig, or you can drill through the back and sides into the edges of the bottom board (use glue). We also did a couple Kreg screws in the toe kick to attach it there, so you could drill down through the bottom into the toe kick instead. 1x8's are actually 7.25", not 7.5" as shown. Sorry! Then you can attach the top (F & G). We started by Kreg Jigging (it's verb now. I will also accept "Kregging") the two top boards side by side. Lay them on top (with the narrow piece toward the back) and line it up flush with the sides and back. 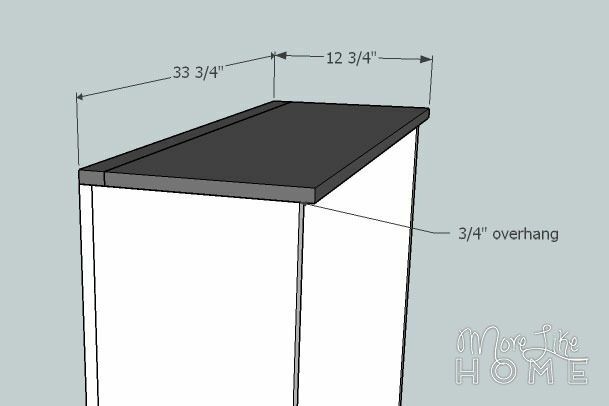 It will overhang the front by 3/4". 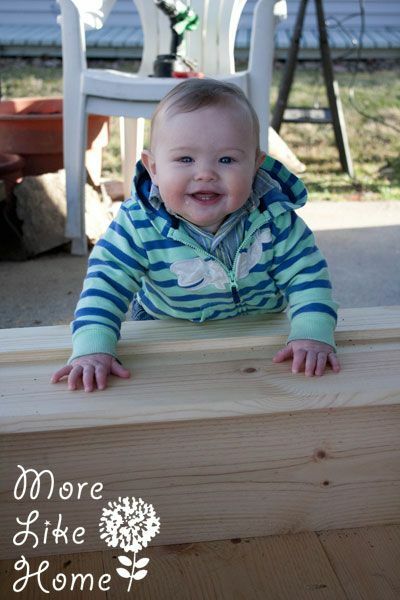 Attach them using a Kreg Jig, or by drilling down through the top into the sides and back. If you don't have one you can start by attaching the narrow piece flush against the back, then the wider piece in front of it. 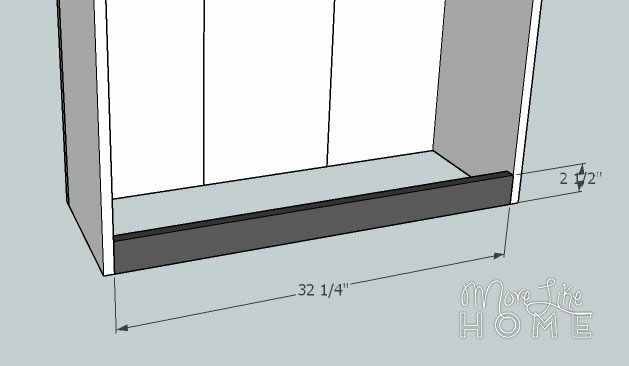 Next you can attach the molding (H) just under the overhang. Use glue and finishing nails. We put a couple nails into each side, then did a few along the top down into the molding as well. 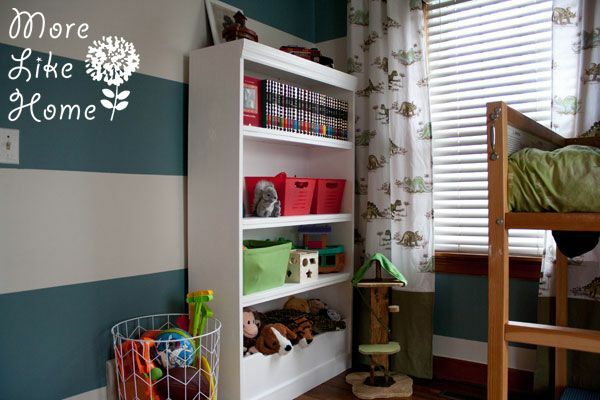 The molding you choose will really set the style of the bookcase, so pick something you love! 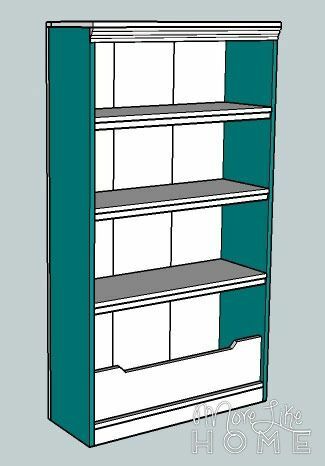 Now you need to decide if you want the shelves to be easily moveable. 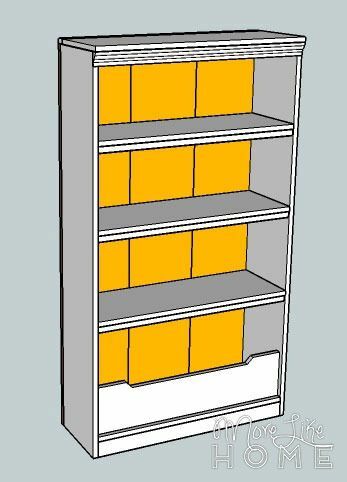 If not, go ahead and install them at whatever heights you like (just make sure they are level) using a Kreg Jig or by drilling through the sides and back into the edges of the shelf. 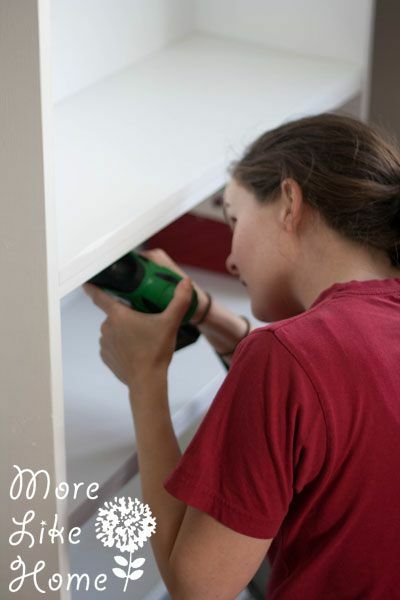 Then skip ahead to fill any holes, sand, and finish as desired. 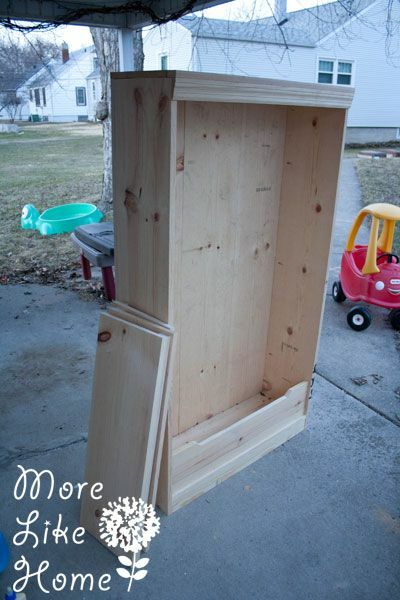 If you want to be able to move them later, then BEFORE you attach the shelves fill any holes with wood filler, let it dry, and sand it smooth (repeat with a second layer if necessary). Using the Kreg Jig most of the holes were hidden on the back so we didn't have many to fill. 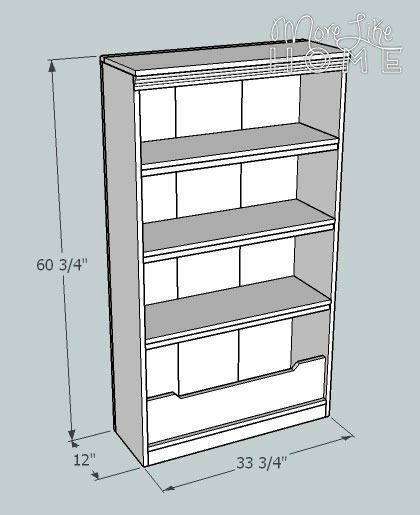 Sand everything smooth then finish the bookcase and shelves separately (and the bin front if you want it removable) with any paint or stain & polyurethane you like. 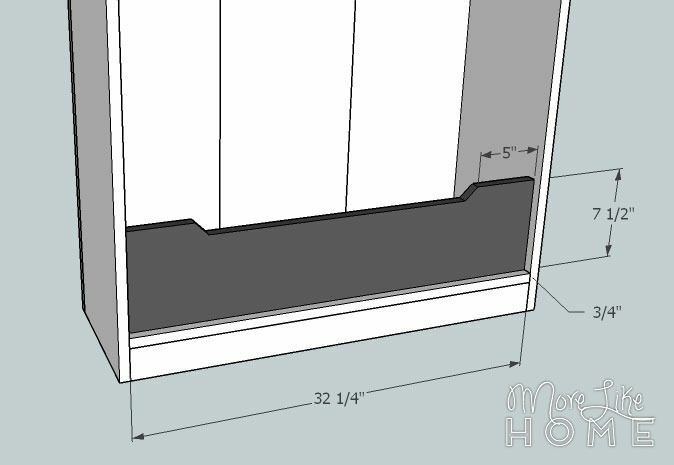 Once everything is dry, THEN you can install the painted shelves into the painted unit (that's what we're doing in the pic below). We used a Kreg Jig to attach it to the sides and back, making sure we got at least one screw in each of the back boards to help hold it all together. If you don't have one, you may want to attach a 1x2 along each side for the shelf to rest across (like we did in the closet here) that could later be removed to place higher or lower (the other option would be drilling through the sides and back into the edges of the shelf, but the screws would remain visible). 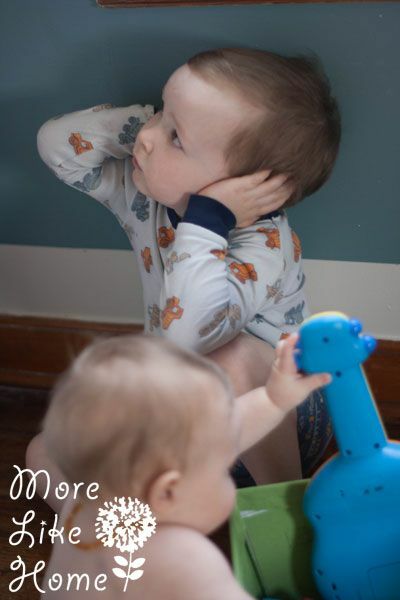 It's a loud job, but somebody's got to watch it anyway. And remember you don't have to stop at plain white! A bright coat of paint on the back or sides is a great way to add pop of color. It's nice to finally have something big enough to hold a lot of the toys without looking like a mish-mash mess. 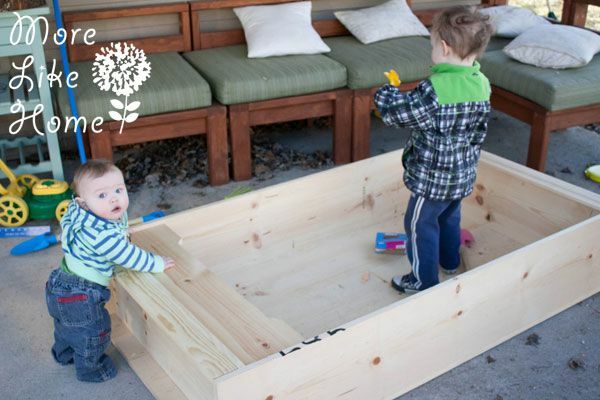 And we love that it's something that we can easily adapt to grow with the boys, or that would even work somewhere else in the house later. Plus we have the option to add another unit next to it if we need more space. I'm thinking we'll just make one for the office too and then if we ever want to put them together we'll have the option! 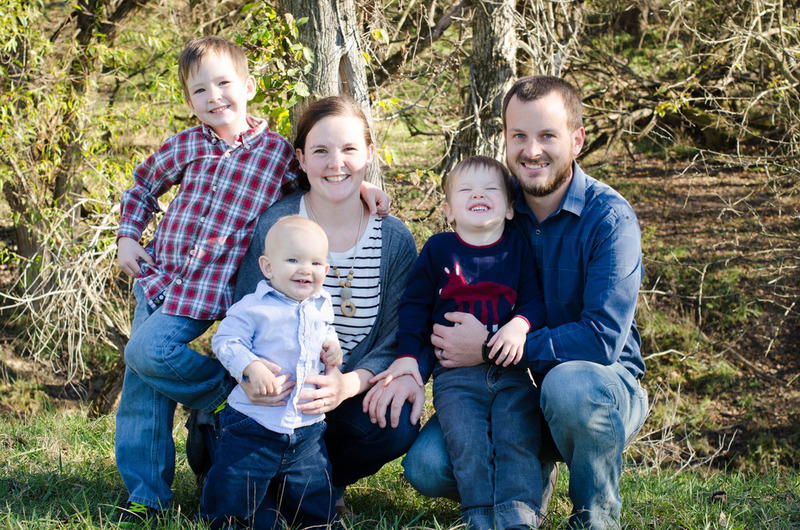 And of course I owe a big shout-out to my favorite helpers (and to Husband for keeping the occupied most of the time!). I'd love to hear your favorite way to store & organize toys at your house. And if you have a DIY solution I'd love to see it!